Full Film and Event Live Stream! 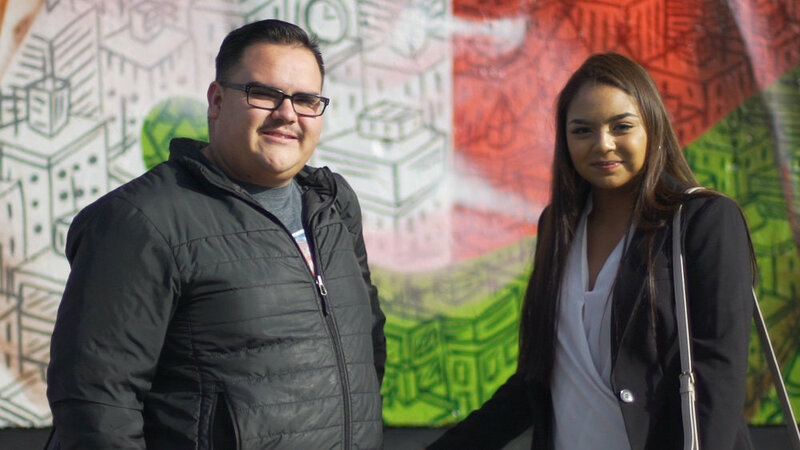 Luz and Victor, DACA recipients, also known as "Dreamers." According to the Pew Research Center, more than 10 percent of Colorado’s school age children in 2014 had at least one parent who is an undocumented immigrant. 750,000 Deferred Action for Childhood Arrivals (DACA) recipients nationwide are now living in extreme uncertainty, because they could have their statuses revoked at any moment. The world changed on November 8th, 2016 in a terrifying way for children of undocumented immigrants. When Donald Trump became the President Elect following campaign promises to repeal the Deferred Action for Childhood Arrivals (DACA), build a wall along the Mexican border and deport millions of immigrants, divisive rhetoric became a potential reality for millions of children, families and the businesses - all humans who are critical parts of our communities and economic ecosystem. Today, so much is unknown: Will President Trump follow through on the promises of Candidate Trump? However, within so much uncertainty there is an opportunity to build public will to resist these proposed measures which would tear families apart and threaten our economy. Beyond the Wall is a rapid-response film born of a grant Stories Without Borders received from The Fledgling Fund that explores the current political climate through the eyes and voices of the children of undocumented immigrants, their teachers, and business leaders in Denver Colorado. The American Immigration Lawyers Association (AILA) is the national association of more than 14,000 attorneys and law professors who practice and teach immigration law. AILA member attorneys represent U.S. families seeking permanent residence for close family members, as well as U.S. businesses seeking talent from the global marketplace. AILA members also represent foreign students, entertainers, athletes, and asylum seekers, often on a pro bono basis. Founded in 1946, AILA is a nonpartisan, not-for-profit organization that provides continuing legal education, information, professional services, and expertise through its 39 chapters and over 50 national committees. About: "Whether it's keeping the smart students we educate here, attracting the globe's most innovative entrepreneurs, or keeping our farms and factories running, our economy demands smart immigration reform now." The Colorado Immigrant Rights Coalition (CIRC) is a statewide, membership-based coalition of immigrant, faith, labor, youth, community, business and ally organizations founded in 2002 to improve the lives of immigrants and refugees by making Colorado a more welcoming, immigrant-friendly state. CIRC achieves this mission through non-partisan civic engagement, public education, and advocating for workable, fair and humane immigration policies. PDF from AILA designed to help you understand the complexity of the immigration system and the possible changes to it in light of Donald Trump’s election. DOWNLOAD HERE. PDF from AILA directory of Colorado organizations that offer free or low cost immigration services. DOWNLOAD HERE. PDF from AILA about how to use a red card. DOWNLOAD HERE. PDF of resources to support teachers, students and families after the election. DOWNLOAD HERE. PDF from AILA about what schools can do to help immigrant families post-election. DOWNLOAD HERE. PDF from The Fort Collins Community Action Network full of resources for immigrants. DOWNLOAD HERE.